Inkjet plotters are well-suited to both graphical and technical applications. The speed of the two classifications is very similar when printing full color images, but there are some very distinct differences. Generally, a technical printer will have anywhere from 4 to 6 ink types, while the graphics printers will have anywhere from 8 to 12 different ink tanks. The additional color variety gives the printer a wider color gamut than the graphical printer. Another fundamental difference is that graphical printers will usually run with pigmented ink sets whereas technical printers will run a mix of pigmented and dye based inks, or operate entirely on dye based inks. 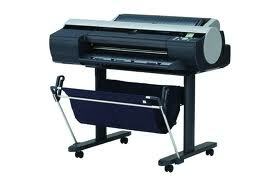 This gives the prints from the graphics greater longevity and brighter properties. Graphics oriented printers will also have an additional print head in order to evenly distribute the ink flow of the additional colors. Click Here to Request your FREE Plotter Comparison Matrix! Canon's imagePROGRAF iPF5100 17" printer is the ideal solution for any color professional looking for high-quality, full-bleed color prints. Built-in calibration helps maintain consistently and an automatic sensor readjusts settings based on the type of media being used. The iPF5100's 12-ink system features red, green and blue inks that produce more vibrant prints versus 5-ink printers. The printer is well-suited for photography, proofing and professional graphic applications. In standard print mode and printing on paper fed from a roll, the iPF5100 can produce one C size print in 1.2 minutes. The ImagePRPGRAPH Pro-2000 is Canon's 24" model. 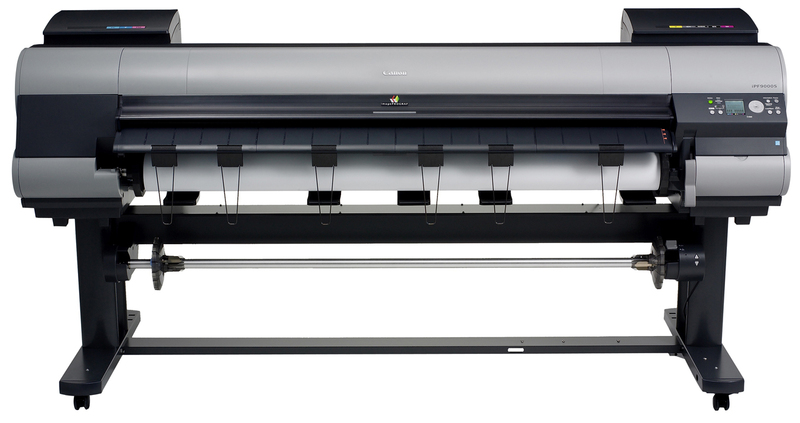 Both the 24" and 44" wide models offer an 11-Color plus Chroma Optimizer ink system. This is the best and fastest printer Canon has engineered! The newly developed print head is a 1.28"-wide with 18,432 nozzles. The biggest ever! Using one print head instead of two enables the new PRO series to be able to achieve faster print speeds. The new L-COA high precision control engine performs the high-speed processing of massive amounts of image data to achieve high resolution prints at an incredibly fast speed. No other printer technology has this capability. Canon's imagePROGRAF iPF6400, iPF6450, iPF6400S and iPF6400SE are 24-inch printers, offering a small, versatile package for those seeking high-speed, high-quality output. This family of printers features devices with 6, 8, and 12-ink configurations. The iPF6400 and iPF6450 use 12 inks and are ideal for fine art, photography and proofing. The iPF6450 also features a 250GB built-in hard drive. The iPF6400S has 8 inks and delivers high quality prints making it well-suited for commercial photography, signage display and retail businesses. The iPF6400SE features 6 inks, including red ink to help produce appealing, vibrant prints that are great for retailers, restaurants, businesses and schools. This 6-ink HP Designjet Z6 24" full-color printer delivers long-lasting gallery-quality prints in black and white / color. Read details more clearly and see high contrast color with new high-definition HP printheads. With HP's dual drop technology, there is no need for light inks. With HP's pixel control, the gradients are smooth and even, even with challenging color combinations. Handle even the most complex files with powerful processing architecture and the Adobe PDF Print Engine. Maps with different sizes can be cut in fewer steps. This is accomplished via the integrated vertical trimmer. Faster prints! Up to 20% faster with the high-definition HP printheads. Media changes are a snap. Spend less time on media changes and adjustments with the dual roll support and automatic roll switching. Applications include banners, exhibition and event graphics, light boxes - film, maps, orthophotos, point of sale/display, posters. PS model: Embedded PostScript support lets you easily work with more complex applications. 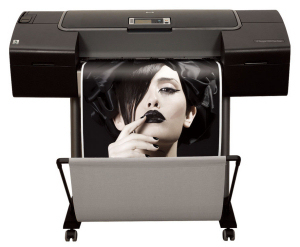 This 9-ink HP Designjet Z9 24" full-color printer delivers long-lasting gallery-quality prints in black and white / color. Read details more clearly and see high contrast color with new high-definition HP printheads. With HP's dual drop technology, there is no need for light inks. With HP's pixel control, the gradients are smooth and even, even with challenging color combinations. This 12-ink HP Designjet Z3200 24" full-color printer delivers long-lasting gallery-quality prints in black and white / color. The Z3200 is easily calibrated and profiled, through the use of the internally embedded spectrophotometer. The Z3200 also features terrific ink efficiency, rivaling all other leading plotters currently on the market. Automatic servicing features help to prevent nozzle clogging and reduce media waste. Embedded TIFF, JPEG and Adobe PS3/PDF RIP allow for direct job submission, queuing and nesting. An HP Embedded Web Server helps streamline print production with print previews to help eliminate trial and error. This 44-inch imagePROGRAF PRO-4000 printer is a high-graphics 11 color printer designed to exceed expectations for image quality and color consistency in a large format printer. The use of new a 1.28-inch wide 12-channel integrated compact print head, LUCIA PRO ink set plus Chroma Optimizer, a high-precision mechanical platform and the L-COA PRO high-speed image processing engine achieves a balance between high-speed printing and exceptional print quality. The new LUCIA PRO ink set adopts newly formulated 11-color pigment inks and a Chroma Optimizer. This system helps you achieve fantastic color reproduction, image clarity, and enhanced darker areas. It faithfully reproduces colors and dark areas crucial for printing works of art. The blue and magenta inks will help recreate the finest details when printing nightscapes and sunsets. A first for the Canon large format printers is the addition of a Chroma Optimizer. Used when printing on glossy and semi-glossy paper, this acts as a clear coat, improving color performance and gloss characteristics enriching the dark areas of a print. This new ink set helps: Enhance gloss uniformity, improve scratch resistance, enhance dark area reproduction, reduce graininess. The imagePROGRAF Pro-4000S 40" printer features eight colors delivered through a 12-channel integrated print-head to produce high-quality prints at high speeds. The sub-ink tank system allows for on-the-fly ink replacement to help ensure long, uninterrupted print runs. The iPF Pro-4000S is a good fit for commercial photography advertisements, retail signage and proofs. The fast print mode produces maximum 1200 x 1200 dpi print resolution while reducing ink costs by 10 to 20 percent. The accounting manager feature tracks job data and calculates printing costs to help track expenses and manage print costs. 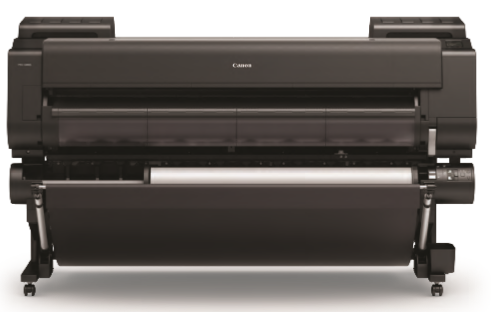 Canon's imagePROGRAF iPF8400 and iPF8400SE are 44-inch printers, offering a small, versatile package for those seeking high-speed, high-quality output. The printers in this series feature 6, 8, and 12-ink configurations. 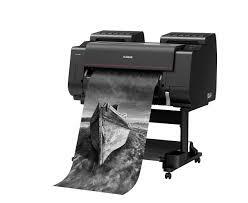 The iPF8400 uses 12 inks and is ideal for fine art, photography and proofing. The iPF8400S has 8 inks and delivers high quality prints making it well-suited for commercial photography, signage display and retail businesses. The iPF8400SE features 6 inks, including red ink, to help produce appealing, vibrant prints that are great for retailers, restaurants, businesses and schools. Both the iPF8400 and iPF8400S use two high-density print heads and the iPF8400SE uses one. All three printers feature a sub-ink tank system which keeps inks in reserve and allows the operator to replace ink cartridges without interrupting print jobs. 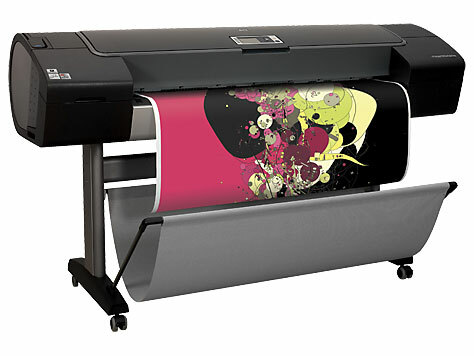 This 6-ink HP Designjet Z6 44" full-color printer delivers long-lasting gallery-quality prints in black and white / color. 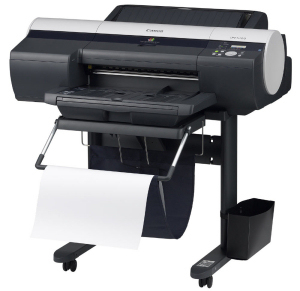 The Z6 44" printer is available is single or dual roll models. Spend less time on media changes and adjustments with the dual roll support and automatic roll switching. Media changes are a snap. Read details more clearly and see high contrast color with new high-definition HP printheads. With HP's dual drop technology, there is no need for light inks. With HP's pixel control, the gradients are smooth and even, even with challenging color combinations. Handle even the most complex files with powerful processing architecture and the Adobe PDF Print Engine. Maps with different sizes can be cut in fewer steps. This is accomplished via the integrated vertical trimmer. Faster prints! Up to 20% faster with the high-definition HP printheads. This 8-ink HP Designjet Z6810 40" full-color photo production printer delivers long-lasting gallery-quality prints in black and white / color. Read details more clearly and see high contrast color with new high-definition HP printheads. The HP Designjet Z3200 44" Photo Printer uses 12 inks to deliver long-lasting gallery-quality prints in black and white / color. The Z3200 also enables easy calibration and profiling with its embedded spectrophotometer, delivering great ink efficiency. HP Professional PANTONE color emulation offers color reliability to ensure high-quality images. The Z3200 can print one D-size color image in 3.8 minutes when using normal print settings and printing on coated paper. D-size prints using the best print settings and printing on glossy paper take 12.4 minutes per print. Embedded PostScript support lets you easily work with more complex applications. The imagePROGRAF Pro-6000S 60" printer features eight colors delivered through a 12-channel integrated print-head to produce high-quality prints at high speeds. The sub-ink tank system allows for on-the-fly ink replacement to help ensure long, uninterrupted print runs. The iPF Pro-4000S is a good fit for commercial photography advertisements, retail signage and proofs. 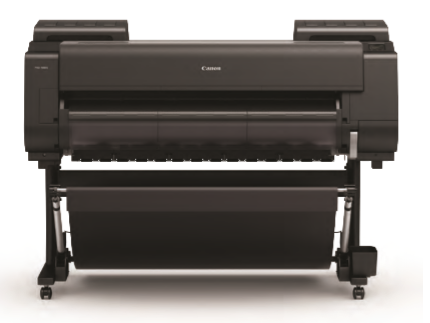 The Canon iPF9400 and iPF9400S are Canon's largest plotters from its imagePROGRAF series. These 60" plotters feature 8 or 12 ink systems, distributed through 2 high-density print heads to produce full-color photographs, fine art, advertisements, retail signage, proofs and more. Built-in multi-sensors offer amazingly precise calibration and color matching to ensure consistent color and high quality. The Accounting Manager features let users track print job data and calculate printing costs to help manage expenses. Sub-ink tanks let users replace empty ink tanks without stopping current print jobs. 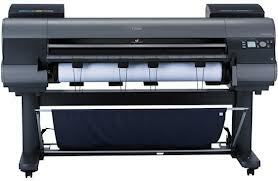 HP's Designjet Z6600 is a fast, efficient 60" graphics printer. The 6-ink printing systems allows users to print up to 30 percent more efficiently when using an optimized configuration. Print speeds range from 1500 square feet per hour in fast mode to 212 square feet per hour in high-quality mode. HP's Multi-dimensional Smart Drop Placement Technology produces high-quality posters, photos, signs, canvas, backlit prints and more on a variety of media. The pigment-based inks provide long-lasting images in both color and black and white. HP's Designjet Z6800 60" graphics printer produces high-quality posters, photos, signs, canvas, backlit prints and more on a variety of media. The printer uses HP Double Swath Technology to produce prints at a high speed.Print speeds range from 1500 square feet per hour in fast mode to 212 square feet per hour in high-quality mode. The pigment-based inks provide long-lasting images in both color and black and white. Users can create custom ICC profiles and get high color accuracy with the embedded spectrophotometer and color center. Optional HP Professional PANTONE color emulation and Adobe PostScript software can help boost color reliability.